The Sanibel Condominium is a premier direct oceanfront building next to the "no drive" beach in the heart of Daytona Beach Shores! Spacious units have exceptional luxury amenities each with oversized balconies overlooking the ocean and river, walk in closets and elegant master suites with balconies. 3 bedroom luxury floor plans are available with 1900 to 2400 square feet. This 11 story, 65 unit complex has a weekly rental policy and allows 2 pets up to 60 lbs. 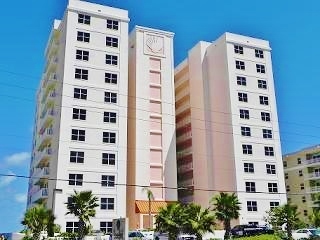 The Sanibel Condo is perfect for a dream retirement home or vacation getaway. Consider the revenue generating possibilities with a 1 week min rental. Have the option to relax in the "no drive" beach or watch the action at the drive beach. This complex sits on the boarder of both!